Sir James 'the Black' Douglas to the English and 'Sir James the Good' to the Scots, James Douglas (1286–1330) was born into a family which was loyal to the Scottish crown. His grandfather was killed alongside William Wallace, his father murdered in an English jail. He spent his childhood in safety in Paris before returning to Scotland when he was aged eighteen. He met Robert the Bruce soon after Bruce's coronation and was the first Scottish nobleman to pledge loyalty to the king. Douglas signed the Declaration of Arbroath and was an important ally of Robert the Bruce. So much so, in fact, that he was second-in-command of the Scots at Bannockburn. Douglas fought alongside Bruce for the rest of his life, where his ability to appear out of nowhere and trounce a larger army gained him a demonic reputation with the English troops. Mothers warned children to behave lest Black Douglas come and find them. For them he was the bogey-man. For his fellow Scots, a hero. The story of 'The Black Larder' in Walter Scott's Tales of a Grandfather illustrates the man's stealth. 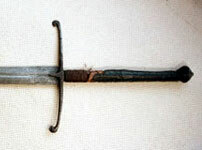 In 1307 he asked Bruce's permission to launch an attack on his home, Douglas Castle, which was still in English hands. Bruce could not commit any troops so Douglas crept home with only two men. He waited until Palm Sunday when he knew the English garrison would be attending church, then he stole into the castle and barricaded the garrison in the church. There, in line with Bruce's 'scorched earth' policy, he razed the castle, killing everyone inside. He next appears in 1314 as Bruce's aforementioned Bruce's second-in-command at Bannockburn. He fought valiantly on the battlefield and chased the English all the way to Berwick. The thought that Black Douglas was on their tail sent the English fleeing so fast that, according to reports, 'they did not even stop to pass water'. He signed the Declaration of Arbroath in 1320, and his last act of loyalty was to agree to Bruce's death-bed request to take his heart on crusade. On Bruce's death, Douglas cut out his king's heart and placed it around his neck in a silver casket. He left for Spain where his fame and reputation ensured that knights from across Europe rallied to his banner. 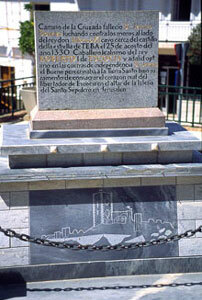 They travelled to Grenada in southern Spain to help Alfonso XI's Castillian crusade against the 'heathen' Moor. In the village of Teba they encountered the forces of Mohammed IV and a fierce battle took place. Douglas succeeded in cutting a path to freedom. Reaching safety, he saw William Sinclair of Roslin isolated and vulnerable. Douglas pulled his horse around and, throwing Bruce's heart into battle, charged with a shout of 'A Bruce, a Bruce'. He was quickly overwhelmed, and realising he was soon to die threw the casket into battle again, crying out: 'Now, go in front of us as you had desired, and I'll follow you or I'll die'. The Scots won the battle, and in the aftermath Douglas's body was found beside Bruce's heart. His men would not hear of him being buried on foreign soil, so his body was boiled in a cauldron of vinegar until the flesh fell from the bones. This was buried in Spain and his bones returned to Scotland. Images and text copyright © The Scotsman. Reproduced with permission.